When asked why cameras were not allowed inside the building, a police officer said "There's no secrecy here." 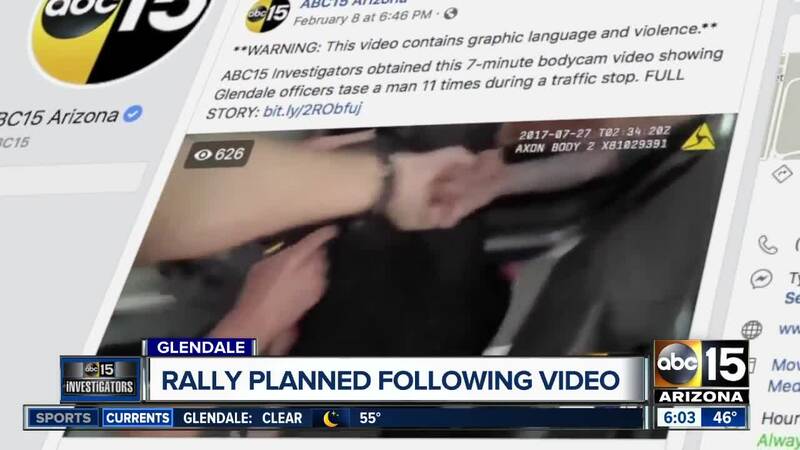 GLENDALE, AZ — Glendale police refused to let cameras inside to record a briefing where officials promised they would share everything with the media surrounding repeated use of force by its officers in a 2017 traffic stop . "This is a full information briefing. We're going to give you all the information on recording once you guys leave," a police official, who did not identify himself, told reporters gathered outside the department's training facility Monday afternoon. 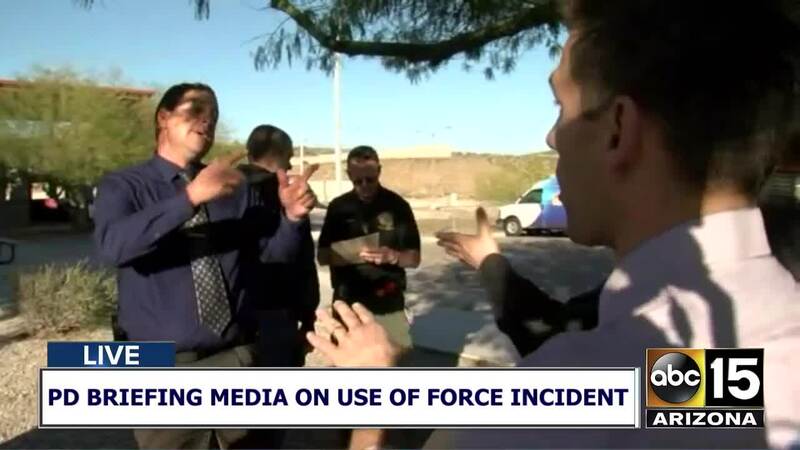 When pressed about why the public would not be able to hear directly from the police themselves, officials indicated that they would tell the media and then the media would inform the public. Reporters were let into the building around 4:30 p.m. The briefing, which was originally scheduled for 2:30 p.m., was postponed Monday afternoon to 4 p.m.
A small group of protesters also gathered at the Glendale Police Headquarters during a 4 p.m rally. Hundreds of comments have been left on a thread about the protest that was posted to Glendale Police Department's Facebook page. The video in question shows a 2017 traffic stop in which a man was tased nearly a dozen times. In the video, one officer is seen kneeling on the man's back as another, Officer Matthew Schneider, kicked him in the groin and pulled down his athletic shorts to tase him a final time in his testicles, according to a federal lawsuit and body camera footage obtained by ABC15. On September 26, 2018, assistant chief Rich LeVander notified Officer Schneider of a 30-hour suspension without pay "based on your violation of City of Glendale Human Resources Policies and Procedures and Glendale Police Department General Orders."